Selling things to strangers can be a trying experience, even scary at times. Ask the Craigslist Killer about his crimes and you'll get the idea. If ever you decide to sell your belongings to a nameless Craigslister, you'll notice the unmistakable scent of risk clinging to the entire affair. My ground rules for selling to strangers are: meet in a public area (usually the parking lot at the local grocery store) and be very clear about what form of payment is accepted (cash is king). Dealing with larger sums of cash makes it very important to stick to your guidelines and have clear communication with the buyer. Seems a bit annoying, doesn't it? Well, Facebook wants in on the transaction of goods between anonymous internet people, making it a personal affair. 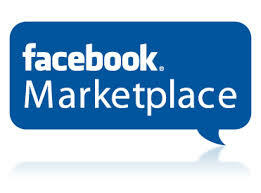 Facebook's Marketplace, a peer-to-peer sales place operating off of the Facebook site or app, will now appear in a new tab at the bottom of your News Feed. iPhone users will find Marketplace between the Groups and Notifications icons, where the Messenger shortcut was. Android users will find Marketplace next to the search bar next to Messenger. Debuted 3 Oct, the add-on is intuitive to use with the purchase and sale of items just a click away on the Marketplace page. Selecting the Marketplace tab will open listings from within a reasonable radius from your location. Items are searchable by category, keyword, and searches can be refined from two to 100 miles away. Upon finding an item, simply message the seller directly to express interest. According to Mashable, Project Manager Mary Ku has said that no money will be exchanged through Facebook, "We're facilitating the connection between buyer and seller, and then they can figure out how to do the transaction themselves." The details of the purchase will be hashed out on Facebook, but the people behind the profiles are responsible for carrying out the actual transaction of goods and payment. This means that unlike Ebay, which is responsible for the exchange of money and shipping, Facebook cannot be held liable if either party does not follow through. Marketplace is meant to be simple. Similarly to Cragislist, only those 18 years of age and older will be able to access Marketplace. However, since Facebook profiles are usually genuine, the age requirement is enforceable. Again, for comparison's sake, we must address the uncertainty of Craigslist, where the person expressing interest in your lovingly preserved holographic Blastoise Pokemon card could well be a 12-year-old trying to pass off his grandmother's £25 check as legitimate payment. If a sale goes south, you aren't left completely out of options. Your buyer's check might bounce, the Paypal payment might not clear, but at least you can identify them in a lineup. Conducting a sale via Marketplace takes the anonymity out of the transaction. Access to someone's public Facebook profile is a priceless tool. It allows you to scope out potential buyers and sellers. The personal touch of Marketplace means that you can be in contact with the seller/buyer at all times. Sales are hashed out in real-time over Messenger. The service is available to those in the United States, United Kingdom, and New Zealand for now. No ads or consumer targeting will be allowed on the Marketplace, in order to preserve the integrity of the space. 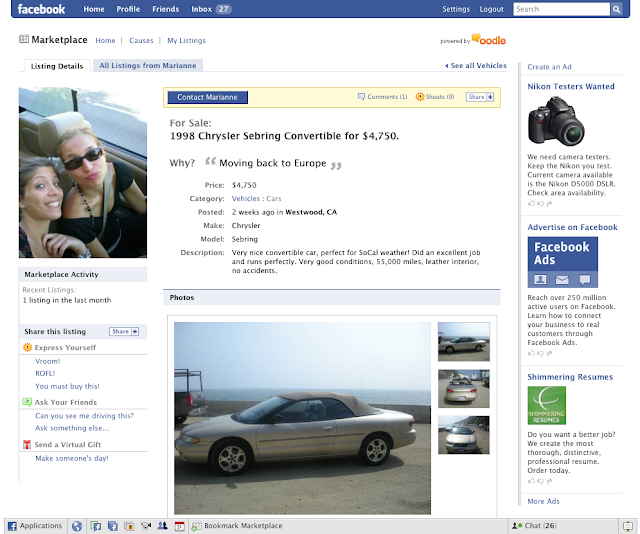 The concept of Marketplace is not new, in fact, it was launched in 2007 in the form of classified ads. The reboot has been spruced to match the times. Improvements in Demand So Soon? Yes, as there have already been reports of illegal items and adult services being posted to the Marketplace. There is, as of yet, no automated system to filter out such things from being listed. Instead, Facebook is depending on those using the feature to report inappropriate items as well as tasking employees to scope the listings. It seems silly to not have a review system in place given that people are using their legitimate profiles to conduct business. Alas, Marketplace is lacking in that regard. An oversight, I assume, since any respectable peer-to-peer exchange system necessitates a review system. Without a means to measure trustworthiness, it becomes difficult to navigate a market saturated with sellers/buyers. Those of us savvy with online purchasing know to read the reviews before buying. Facebook, please.